- October 2018 : Released ! - Holoroom has 2 ress nodes (like original ns_hera) but one is not working and obstructed by a piece of metal. This is to help rookie understand this is an important place in the map (for PG for example), but I didn't want a double ress here (or I should have delete Cargo...). - Added armory for Marines at start because it's a hard map for marine I think. - Absolutely no "OcclusionGeometry" was in the map (Crappy FPS you guess...) so I added them. It's still far from perfect. But the map doesn't use much props so the framerate seems ok.
- Making Data Core Delta defaut hive for alien. I won't improve this version so much since It has been original imported from NS1 trough Blender ( https://www.blender.org/ ). Technicaly, they are tons of duplicate line & point, and lots of points aren't even in the grid, making it very painfull to work on some areas. I may plan doing a new ns_hera from schratch, or at least a descent Layout (I've drawn a new layout on small tile sheet). 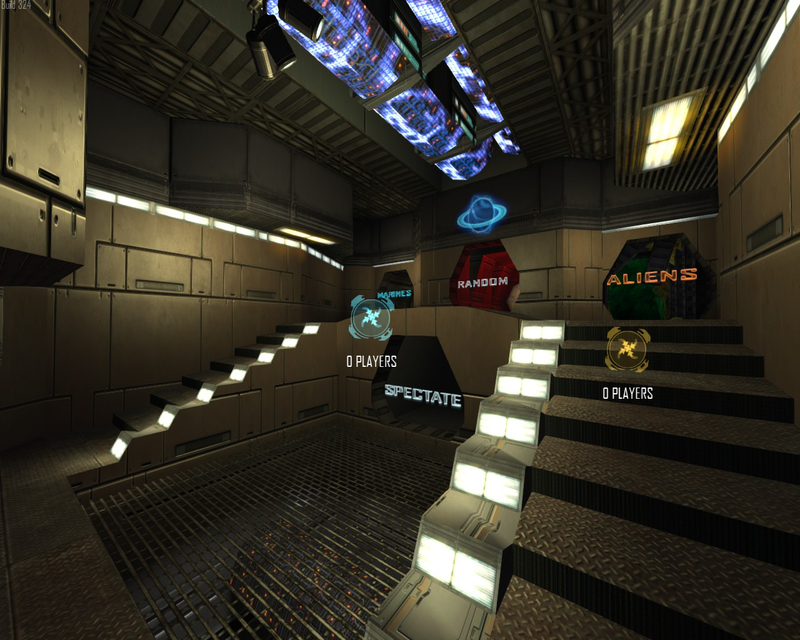 Oh by the wait if you know a way to contact Janos & Alibi who started to remade ns_hera (but abandonned) I'm interested. I know the map isn't perfect, thus I spend a lot of time on it (200 hours I guess ...to be honest I tough I would give up ! ), but I hope you'll be happy to play a descent version of hera in NS2...!! Don't hesitate to post constructive feedback here or on the steam workshop page (I don't use discord sorry). - Lots of Optimisation ! So... you took the NS1 hera and edited it or you took the DMD hera and edited it? It's great to see this map being worked on more It's a good map. 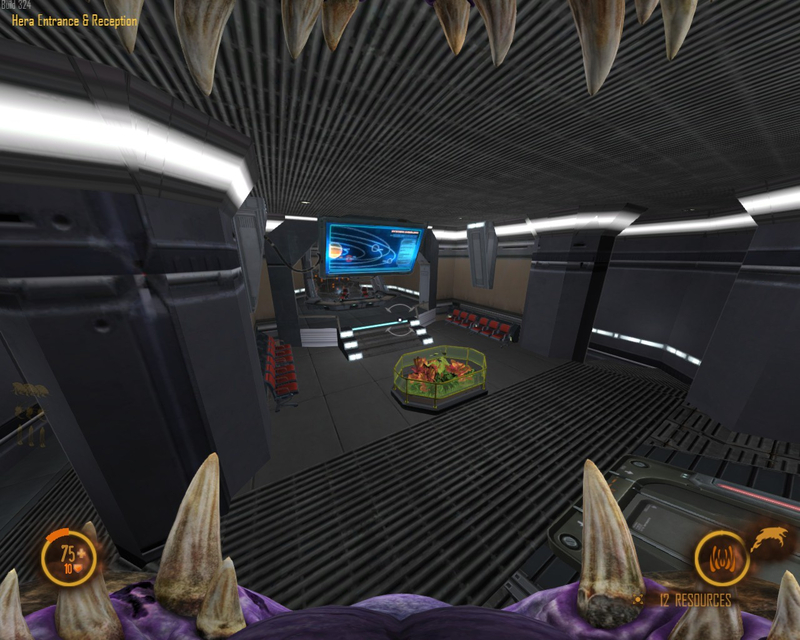 It was originally setup for Classic mod and needed some restructuring for NS2 style gameplay. It was left uncompleted and I know the amount of work that needed to go into it and am grateful for your time spent on it Xale! I can't wait to try it out Thanks Xale! 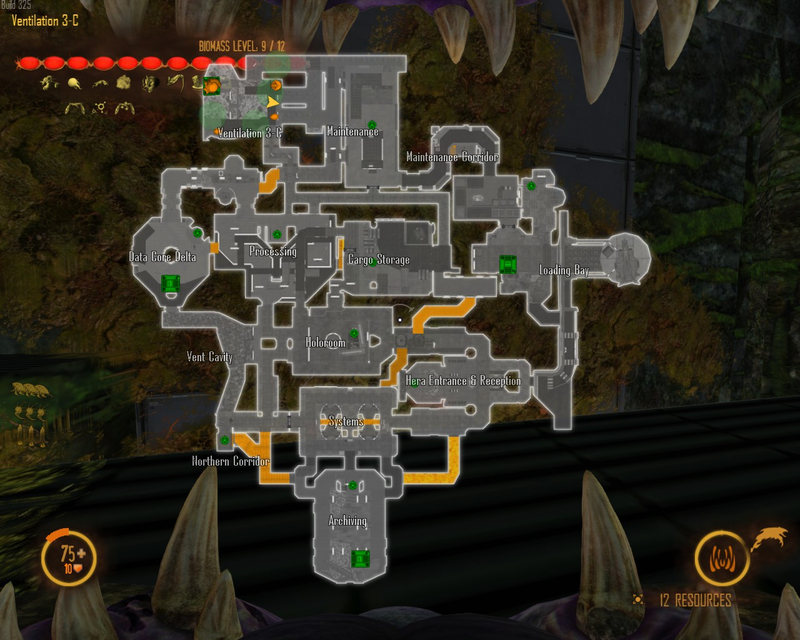 I think this map needs more adjustments to NS2. First of all: Get rid of that giant outside area on the minimap. There is no reason fot it to be rendered. Then, remove the starting armory. This messes with the game balance. There are also some layout issues. Marines should not be able to immediately reach the center of the map. There seems to be overconnectivity issues in some areas and also LOS issues. It seems there are unfair ARCing spots for Data Core and Ventilation. The way Archiving is connected to only one other room will lead to problems. The way Ventilation is connected also seems problematic. There is a general lack of vents in this map. 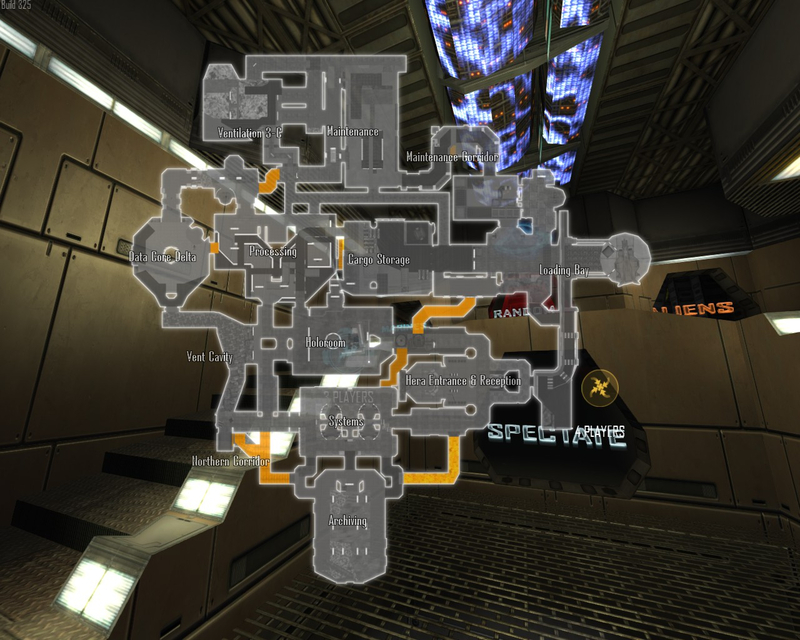 I think this map needs more adjustments to NS2. First of all: Get rid of that giant outside area on the minimap. There is no reason fot it to be rendered. Perhaps I should change my mini-map extent you mean ? Then, remove the starting armory. This messes with the game balance. This is more a personal feeling about NS2 in general. Amonst all, marines have 2 big issue : if they start with 1 IP, they are fucked : a 2nd IP cost Waaaaaay too much. 2nd issue is RT that cost 10 in marine, they cost 8 in aliens. Knowing hera for a long time, this has always been seen as an alien-favourite map even in the well balanced NS3.2. Thus, the armory starts unbuild. There are also some layout issues. Marines should not be able to immediately reach the center of the map. They don't. I have blocked the path with crates (you didn't launch the map did you ? à. I remembered BeigeAlert message : "2 exits are enough, it's not about how marine can go out it's about how alien can go in"
There seems to be overconnectivity issues in some areas and also LOS issues. Not sure by what you mean by LOS ? It seems there are unfair ARCing spots for Data Core and Ventilation. The way Archiving is connected to only one other room will lead to problems. The way Ventilation is connected also seems problematic. There is a general lack of vents in this map. Wow I just realised they don't appear in the overview. If someone has tip to get them appear, give me some tip or links please ! 1. LoS means "Line of sight"
3. I would seriously suggest you don't have any structures for either team at the start of a round that aren't typically in all the other maps, regardless of your beliefs about balance, it will create inconsistency between maps and make the game as a whole more difficult to learn for newer players. 4. If you don't want something to appear on the minimap, add the geo to a group called "CommanderInvisible" (no quotes) and select the props and set the value of commander alpha to 0. Welcome to the mapping community, its great to have more new faces around! Oh yea, sorry I should have explained things better. As Kash says: Everything inside of minimap extends is rendered for the minimap. If you want things to not appear on the minimap, you place the geo in the CommanderInvisible group and put commander alpha value to 0 on props. If something is outside of the playable area nad just there for visuals, it should not be seen on the minimap because it is an unneccessary cluttering of the view. It is also something the commander does not need to be able to see. And yea, there must be some consistency between maps in general. Personal opinions on balance should not affect the map. Besides that, balance changes often, and you want your map to be playable in NS2 in a general sense, not only for this specific build. I am sorry, I didn't launch the map yet, I gave feedback based only of the minimap you show. I will take a run around on the map as soon as I can. On the map it looks like the pathway from Marine Start to the center is not blocked. If it is, I hope it also blocked for aliens. Because inaccessible vents leading into marine start, especially if marines need such a long way to get to the other side, is frustrating and should be avoided. Either way, it is either a vent and should be marked as that, or it is a dead end and those should be avoided in general too. I will test the ARCing spot in Processing. But honestly I can't see how this could be fair with this layout. My feeling is, this map looks a bit too much NS1, and not enough NS2. I think that vents and pathing geo are layers instead of groups is very weird and can only be confusing for new mappers. 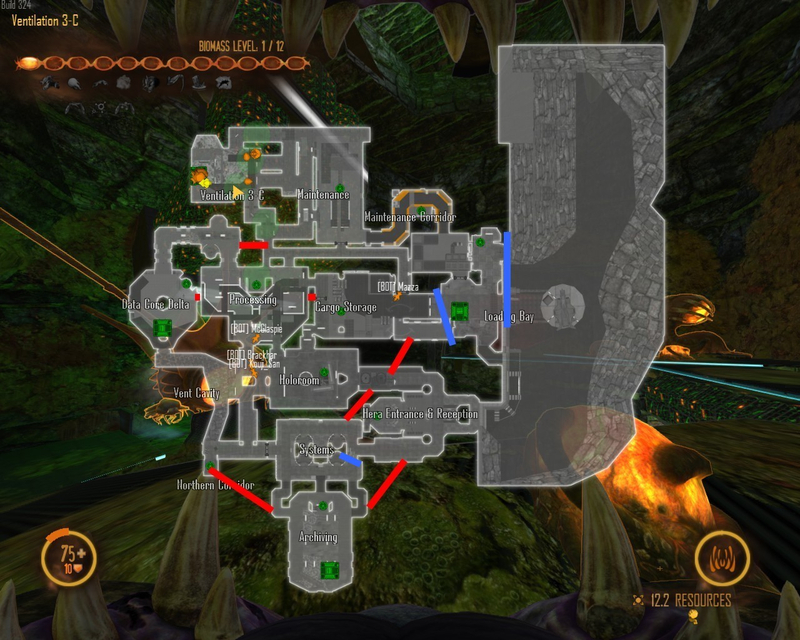 But yea, everythign in the layer called Vent will render in those orange vent colors on the minimap. If you want a vent to be in addition commander invisible however, you need to put it into a group (!) CommanderInvisibleVents. I am glad too see new mappers aswell. Looking forward playing this map. Make sure it is play ready so it can be played at SCC. I also highly recommend you join SCC on Discord, it is much easier and faster to get assistance in mapping there. arc_range_circle will show the exact range of an ARC. relevancy_range_circle will show you the exact range of LOS, meaning, how far things get rendered. You probably know how players disappear in North Tunnels on Tram if you stand in South Tunnels because they are too far away. This should be avoided and that circle entity helps you to see in the editor how far the relevancy distance is. Your mod is not correctly setup. You should use LaunchPad for it. Start LaunchPad and press New. Then name your mod (I suggest ns2_hera), check "Create from a basic template" -> This will setup the mod folder correctly for you. If you have done that, press on the source folder icon in LaunchPad, then you will find more folders there. One of them is mapsrc. As long as you don't have any custom assets, this is the only folder you need. Inside of that mapsrc folder, place your level file. It should look like this: [...]ns2_hera/source/mapsrc/ns2_hera.level. This is the one you should work with. If you want to publish your map in the workshop, click on builder in LaunchPad and let it build, it will automatically create the proper output folder for you. Then, just hit publish and it will upload your mod correctly to the workshop. Yeah I figured this but not sure how it applies in NS2...! 4. I would seriously suggest you don't have any structures for either team at the start of a round that aren't typically in all the other maps, regardless of your beliefs about balance, it will create inconsistency between maps and make the game as a whole more difficult to learn for newer players. I understand but hera is very special. Thus it's very easy to edit for further version. I blocked a door with crates that's why. Props are easy to add/remove. Well I tryed, it arcs. But I think "it's in the game". Central hive has an impressive avantage in general, especially if it's the first hive. so it's not unfair to nerf it a bit. Arcs cost much and processing is hard to keep for marine I think. So it's fair. I already tryed Discord and failed, really not used to it. Yeah I found arc_range_circle ! I think my LOS is ok on the map. The rooms aren't big. In this scenario I mean, because this is an asymmetrical game (ranged versus melee race), it is generally bad for gameplay if LOS is too large, which basically means something like 1) Too empty / big rooms 2) Too long corridors / not enough cover for the length. Did you build the map using builder? You don't want anything on the minimap that isn't in the playable area for example. The complete outside area shouldn't be on the minimap. Ok I'll try that now ! Do I need to check something here ? No, that is just for tagging in the workshop. The important thing is to check the template thing so you get all folders in place. What is the new mod id? I still have problems loading the map. is there another way to get the ModID than going to this folder ? I'm on it what's your Name on discord ? oh yea just remove the game setup file, sorry lol I forgot it creates that. There shouldn't be anything else in the source folder than your map at this point. 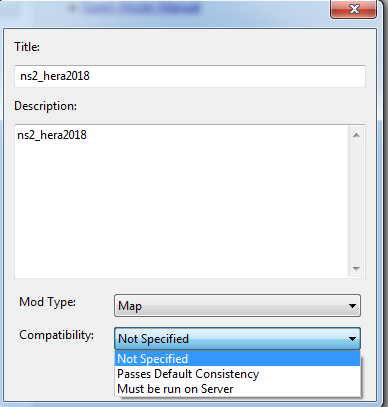 In your ns2_hera2018 folder there should not be anything else than the source and output folder, the mod.settings and the preview.jpg. You can replace that preview image with another one if you want your workshop image changed. Don't hesitate to download the map on the workshop, try it with bots, tell me your feeling and Ideas. Also tell me about performance. I may change layout a bit to physically separate Cargo from Marine Start, altough you can't access it because the door is blocked by crates. This would allow better understand of the layout and i'll be able to add a big occlusiongeometry. I just checked the map, because of your vent issue. I suspect it happens, because you also have a "vent" layer. Mark the vent layer so you select all the parts in it. Then uncheck the vent layer they are in. Then uncheck and recheck the Vents layer, so the vent-geo is only in that layer! Do the same for the other vent layer. After the vent layers are empty and everything is only in Vents, delete the two vent layers. I think the first thing to do should be improving the general layout and the room layouts before tackling smaller problems. The map needs more straightlined connections between rooms. The whole central and northern area is basically a mess. There are far too many connections. Examples: Northern Corridor to Hologram has 2 connections. Hologram to Processing has 2 connections. The long hallway between Maintenance, Cargo Storage and Processing is too narrow, too long and connects too many things. Ventilation to Maintenance is a maze with too many routes to count. The map generally feels very "compressed" on the North side. Because of the low distance between Ventilation and Delta you put the connections between them over Processing which looks like a band aid and creates a lot of problems. Archieving is not properly integrated into the map. It has 3 seperate entrances which are all next to each other and lead outside of the map. Cargo Storage has also a bad integration. Aside from that long hallway (which is basically a giant 180° turn you take if you use that from Cargo) it is basically a giant dead end. The RT placement is a bit weird. There is too much value in holding the center of the map with 3 RTs. The RTs on the North side also seem to be much closer to each other than on the South side. Also the marine naturals are very inconsistent to each other because one is a lot closer than the other. In terms of room layout, there are often issues with too much level over level. Not only is it bad for commanders, it is also bad for gameplay. Processing is a maze with no clear path and no clear ways between the different height levels which are too many anyway. The room between Marine Start and Maintenance Corridor has waaaaaaay too much verticality and that should be avoided, it plays just frustratingly and it is much faster going down than going up. Do you consider this map greybox? Because there are a lot of issues with too empty rooms and very simplistic geo, which is kinda expected in a greybox map. Northern Corridor also should be some kind of room because right now it is a narrow carridor which doesn't offer good gameplay around RTs. The reason of existance for corridors is more to connect between rooms. I think you didn't get the point of ns2_hera2018 It's basically a dirty port of ns2_hera from NS1 (v3.2 to be precise), because people like me & others absolutely loved this map ! I started the rework from NS2_hera from Rusty wich had LUA code with NS1 gameplay (I didn't want to work for something from scratch has this point because I didn't have enough skill). I removed all lua stuff and added NS2 gameplay mecanics, and fixed a lots of stuffs. The whole central and northern area is basically a mess. There are far too many connections. 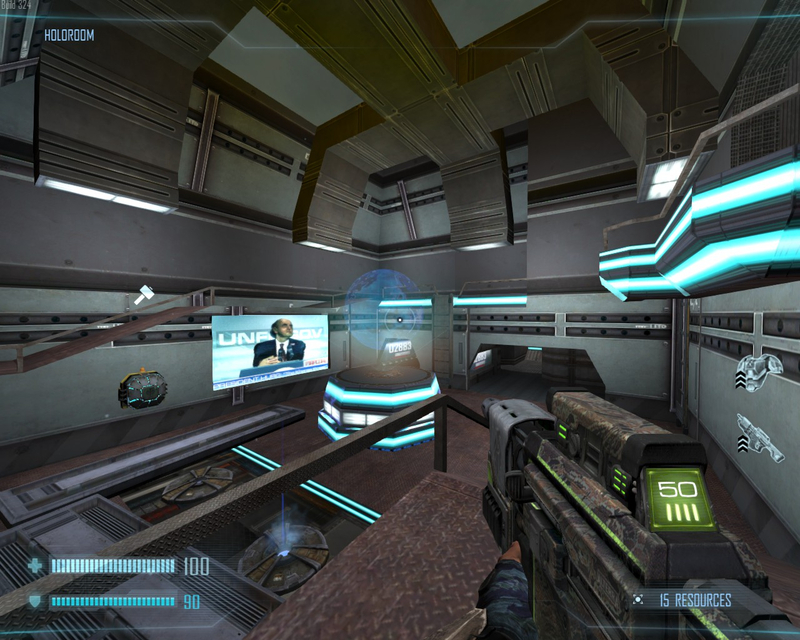 Examples: Northern Corridor to Hologram has 2 connections. Hologram to Processing has 2 connections. The long hallway between Maintenance, Cargo Storage and Processing is too narrow, too long and connects too many things. Ventilation to Maintenance is a maze with too many routes to count. The map generally feels very "compressed" on the North side. Because of the low distance between Ventilation and Delta you put the connections between them over Processing which looks like a band aid and creates a lot of problems. The compression is due to the fact NS1 map couldn't have been larger because of the HL1 engine. Yeah that connection is kind of "band aid" but no choice, thus it give an interesting layout. Archieving is not properly integrated into the map. It has 3 seperate entrances which are all next to each other and lead outside of the map. Cargo Storage has also a bad integration. Aside from that long hallway (which is basically a giant 180° turn you take if you use that from Cargo) it is basically a giant dead end. Totally Agree, not sure what to do with this part of the map. Cargo used to have a Weldable door to Entrance & Reception. The RT placement is a bit weird. There is too much value in holding the center of the map with 3 RTs. The RTs on the North side also seem to be much closer to each other than on the South side. Also the marine naturals are very inconsistent to each other because one is a lot closer than the other. Again it's an Hera thing. If I remember well, Maintenance Corridor use to have an RT, then was removed in NS2.0 due to cargo storage beeing directly accessible. I decided to put it again, because I blocked again the way to Cargo storage. It's true that it's closer from Entrance & Reception, maybe I should have rework the giant room with stairs here. BUT from a different perspective, Maintenance Corridor has very poor light, giving an advantage for aliens. Yeah of course I noticed this map has too much up and down. Most of remake (like Ns_nothing or ns_origin) have smaller up/down. If you want you can draw a layout on small tiles paper. I've done that, will post this later I guess. I finally figure it out. There was another Layer called "Marine corri smthing" that took the Vents functions of the overview (that's why I had some Yellow in maintenance Corridor". I guess it's a SPARK bug, so I removed that layer and also all Vent/Vents layer close editor and create a new Vents layer = now it work !! Don't hesitate to give me feedback.